It’s September! It might still feel like summer now, but in a few short weeks, the temperatures will drop and it’ll be time to break out your cozy sweaters and partake in all things pumpkin spice. And then there’s fall cooking! As much as we love sweet corn and summer grilling, we’re still pretty excited to start working some hearty soups and stews back into our dinnertime rotation. 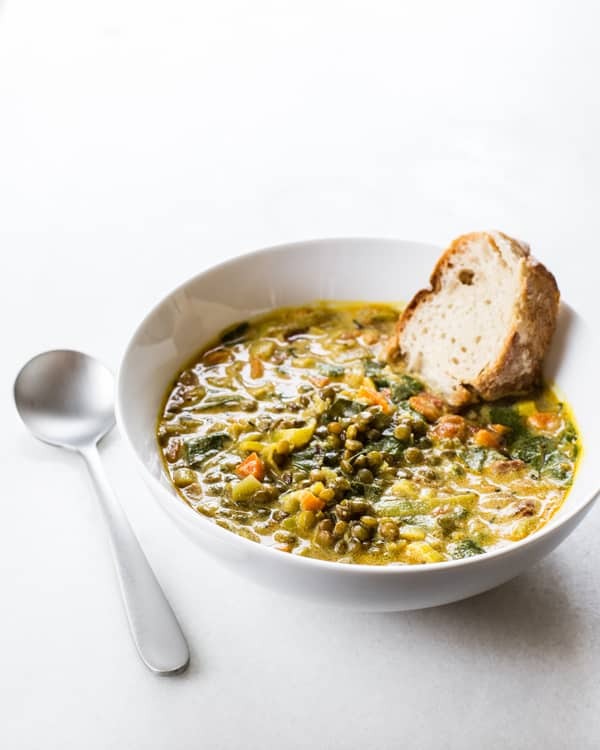 This Golden French Lentil Stew is the kind of comforting, filling dinner that’s perfect for chilly fall nights. French lentils don’t fall apart like some other varieties, so they’re practically made for recipes like this one. They’re combined with greens and veggies in a creamy turmeric-spiked broth. The best part? Leftovers can be popped in the freezer for later. Win! Oh She Glows Every Day is the latest cookbook from Angela Liddon. We adored her first cookbook, so we had big expectations for this one and we weren’t disappointed. With over 100 plant-based recipes, this book will be well-loved in any vegetarian kitchen. It’s full of gorgeous photos and no-fuss recipes that make weeknight dinners so much easier. Purchase Oh She Glows Every Day on Amazon.com. Put the cashews in a bowl and cover with a couple of inches of water. Soak for 1 to 2 hours or overnight. (For a quick-soak method, cover with boiling water and soak for 30 to 60 minutes.) Drain and rinse. Transfer the cashews to a high-speed blender along with 1/2 cup (125 mL) of the water. Blend on high until super smooth and creamy in texture. Set the cashew cream aside. Stir in the cashew cream and chard. Add salt, pepper, and vinegar to taste. (The vinegar’s role is to add a little bit of brightness to the soup; add a bit at a time and keep tasting, as it can quickly overwhelm.) Cook for a couple of minutes over low-medium heat, until the chard is wilted, and then serve. This stew will keep in an airtight container in the fridge for up to 5 days, or you can freeze it for 1 to 2 months (always let it cool completely before storing). The stew will thicken after sitting in the fridge; you can thin it out with a bit of broth when you reheat it, if desired, or simply serve it thick with some crusty bread. So what would you sub for the cashew cream? I”m not vegan, and definitely enjoy dairy. Cream? sour cream? Kiersten, thank you so much for your lovely words!! It means a lot. 🙂 So happy you’re enjoying the book so far! I agree French lentils do hold together nicely, especially in soup. Comfort food is on the top of my list this month and this recipe sounds great! This is my first time commenting on your site and yes I read the comment policy. Good job. No room for negativity! I made this tonight and it is super tasty! Loved it. We loved this! I used the sunflower seed options to add creaminess and admit I had my doubts on how that would turn out. I absolutely LOVED this stew and highly recommend it and the Oh She Glows cookbook! Made this last night. It is soooo good! I did kick the heat level up quite a bit, I like my food spicy, and I had a half can of coconut milk sitting on the counter leftover from what I’d just made previously and I used that instead of the cashew cream (I never remember to soak those darn cashews). It’s sort of a curry-y thing anyway and the coconut flavor went well with it. Thanks for sharing! I had to leave out the tomato and garlic due to food sensitivities in my 4 year old, so I added extra vinegar and uses red wine vinegar instead of white (3 TB), and this is still AMAZING STEW. We will have it again and again. Very good, my kids ate it and me and my husband loved it. I will make this a couple of times a month. Can I use tahini instead of the nuts? Hey Jeannie, we haven’t tried that substitution, but it sounds like it could work. If you do try please let us know how it turns out!